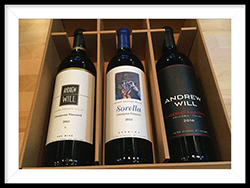 One bottle each of our premium wine 2013 Sorella red wine (94pts), 2013 Champoux Vineyard red wine (93pts) & 2016 Columbia Valley Cabernet Sauvignon (92pts). Price includes ground shipping within continental US. Extreme weather may damage wine, therefore during times of extreme weather conditions we DO NOT ship orders. We will be happy to hold onto your wine until it's safe to ship. Purchaser and recipient must be at lease 21 years of age. UPS Ground is our standard shipping method. If you prefer FedEx, please indicate in the "comments and special instructions" when you order. If you have a time sensitive order, please call 206.463.9227 or email info@andrewwill.com. A total of three delivery attempts will be made before the shipment is returned to our facility. © Andrew Will Winery. All Rights Reserved. Site designed by Chris Jonic. Site built by Howie.